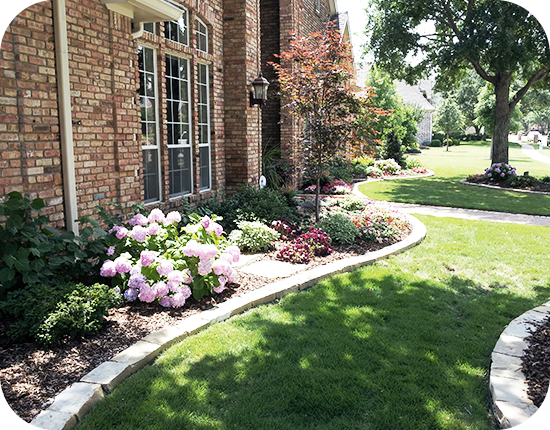 PLM Landscaping and Outdoor Living is a full service landscape and design company dedicated to providing the highest level of service in the Dallas/Fort Worth area. For more than 30 years, we have taken pride in providing the highest level of customer satisfaction. It starts with highly trained professionals with years of expertise in landscape design. Because we’ve been a trusted leader in the industry, we know exactly what residential and commercial clients need to get the best results. Our experienced and certified landscape professionals use only the finest tools and equipment to quickly add new life to your property. When it comes to your landscape design, there is no such thing as a bad question. Our professionals can answer any of your questions about landscape design in the Dallas/Fort Worth to ensure your property looks its best. When it comes to landscape design, the possibilities are endless. Use your imagination or let our landscaping professionals design the perfect landscaping options to create greater curb appeal and a fresh new look to your property. Even if you’re happy with your present landscape, we can offer solutions to help improve your property’s appearance. A new sprinkler system can do wonders to bring new life to your lawn and plants and vegetation. We can design new architecture to bring new ambiance to your property. But the best part is all these solutions are completely affordable. We make the extra effort to make sure our work complies with all local zoning and building codes. Get started on creating the landscape design of your dreams. Call the team at PLM Landscaping and Outdoor Living today at 972-492-0088 and discover the difference.